The ritual of our arrival had been startling, outside of our cultural norm. The entire town lining the streets and waving tiny American and Japanese flags. “Is this some kind of a holiday?” we asked the mayor. “YOU are the occasion,” he replied with a chuckle. Lloyd, our translator Masako and I boarded the waiting train. The family assembled outside our window, the colours of their sweaters and jackets making a somber study in mauves, blues and gray. They did not wave, but stayed in their places as if a portrait photographer were taking a long exposure. The women were in the front, the men behind them. Hiroshi, Hanayo, and Chiyon—the three sisters of Yoshio Shimizu—stood elbow to elbow, their hands clasped together. 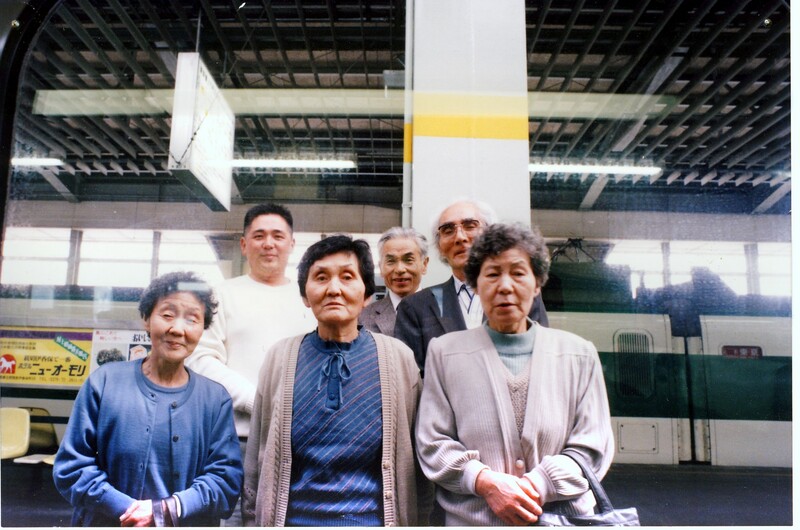 Behind them: Hiroshi’s husband, Suezo; cousin Yasue, the farmer, and beside him, the new patriarch, young Yoshinobu, Yoshio’s nephew. When have I taken enough time with an exit, created a ritual if none existed? Perhaps the Shimizus assumed this tableau to allow us to sear the image into our memories. No fleeting goodbye, like so many others, all forgotten. And they are still there in my mind’s eye, after all these years. Their calm presence at the moment of departure marked the rarity and depth of our unlikely meeting and how it had transformed all of us.